Sash Fasteners offer a traditional method of fastening sash windows. These designs are neat and concise to ensure space isn’t compromised. We have a wide selection of quality designs that have been manufactured with brass or chrome. Another effective method to keep sash windows securely closed is installing any of our Casement Fasteners. They offer smooth operation to make the process of opening and closing windows far more methodical. In order to regulate how far open you want your sash windows, we have a wide range of Casement Stays. These products allow you to securely fasten your windows at different distances. This is highly beneficial during cool weather conditions. In order to enforce safety onto your sash windows, we have Jackloc Window Restrictors. These designs will ensure that windows can only be opened at a certain distance. This is highly important for buildings that have windows situated at a high level from the ground. To operate sash windows effectively, you will need any of our Sash Lifts & Handles. We have a wide range of designs that have been made from high quality materials such as chrome and brass. Certain sash windows operate with a rolling mechanism, which will require the installation of Sash Pulleys. They have been specially modified for use on traditional rise and fall windows, using a carry cord to counter balance sash weight. These designs work best when they have been placed twice at the top of windows and twice at the bottom. 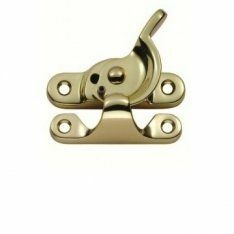 We also have the 19mm Roller Sash Stop, which can be located on our Sash Stops page. This product is a top of the range brass socket screw which has been manufactured by Zoo hardware. We offer a variety of finishes which include; polished chrome, satin chrome, polished brass, PVD nickel and Florentine bronze. Balance is also an important factor for sash windows. In order for smooth operation, we recommend using a Sash Cord, which will help with weight distribution. This can be further enhanced by selecting the correct sized Sash Weights for your window. For any windows that are out of reach, we have Fan Light Catches. You will be able to open and close windows by simply hooking onto the catch area. Our products include all the required fixings, flat plate and receiver staple. Finally, we have Fanlight Stays to allow you to set exactly how far open you want your windows to be opened. These products have been manufactured by the Carlisle Brothers and come with a 10-year mechanical guarantee.